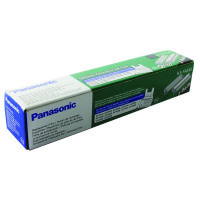 • Ink film for Panasonic fax machines. • Page Life: 140 pages. When it comes to the technological sector, Panasonic are one of the best known brands. They have attained this position through the consistent production of the highest quality products. With this ink film you can guarantee that you are going to get the very best level of prints, with quality that cannot be beat. Each line is guaranteed to be sharp and precise, leaving you with text that is of the highest clarity and images with the best definition.